Earn $8.20 in VIP credit (820 points)What's This? SRAM first introduced their 10-speed road cassettes using the Openglide design which had a section of each cog missing for easier transitions from gear to gear. Some felt that this caused the chain to catch and actually negatively affected shifting. Others love it and feel it is an improvement. 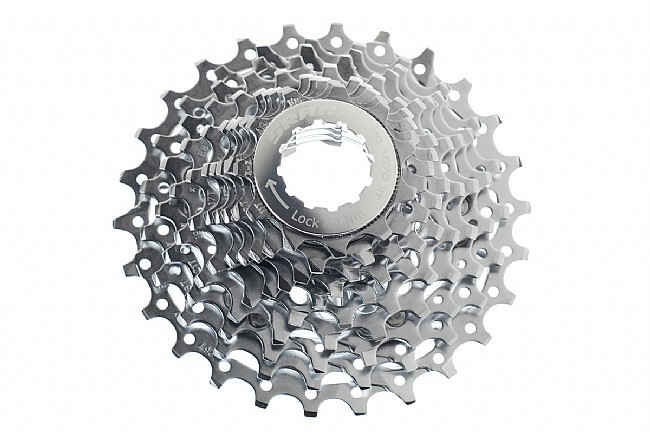 Now SRAM gives you a choice by making a 10-speed cassette with their more traditional Powerglide tooth profile. Heat-treated steel cogs for long life. Last three cogs are on an alloy carrier and have holes at each tooth to save weight. 7000 series alloy lockring included. Compatible with SRAM/Shimano 8/9/10 freehub bodies (NOT compatible with Shimano 10-only freehub bodies). Compatible with SRAM or Shimano 10-speed chains. 230 grams (weighed with lockring). Great product, very smooth and more affordable than Shimano. I use this for either training andor racing. Great cassette, helps a lot on steep hills! I was having trouble getting up a 12-14 percent grade until I got this cassette on my road bike. It gave me more confidence to ride steeper terrain. I live on a very steep mountain with grades that are over 20% in sections with an average grade of 15%. While the climb is short 2.5 miles after a day of training its not the best way to finish off a hard riding day. I bought this 11 x 32 PG1070 to see if I could get some extra gearing for climbing back to my house. The cassette actually works with my 10 speed ultegra so on days where I don't want to use my standard gearing (11 x 28) for climbs I've got a great alternative. Works well and gives those extra teeth to keep the cranks spinning. 11-32 gets this fat old man spinning up the hills. Heavy rider needing an extra gear to get up some steep hills without standing on my pedals.The 32t sprocket does the trick. I did have go to a longer chain and swap to a medium cage derailleur. Switched to this cassette for the 32 tooth ring to help ease the strain on my 53 yr old knees for the mountains I climb. What a huge difference! Much less strain on the knees and it is silent. SRAM makes the best cassettes in my opinion and this one doesn't disappoint. I've not yet put a lot of miles on this particular cassette but previous SRAM cassettes have proven durable, adequately light, and have generally performed well. At present this cassette is a bit pricey relative to comparable Shimano cassettes but assuming that the durability of the present cassette matches my previous SRAM experiences, the higher price is reasonable. I prefer the cog spacing of the SRAM 11-36 (as opposed to comparable Shimano cassettes). If using this on a road bike, consider using a long cage rear derailleur or possibly a Wolf Tooth RoadLink. Also consider a new chain when replacing cogsrings. I've used this cassette with Rival, Force and Ultegra cranks. Shifts smoothly and runs quietly. When used correctly (limited cross-chaining) this cassette has lasted me many thousand miles. Would highly recommend. Great cassette. Love the nickel plating! Purchased a PG-1070 SRAM 12-28 cassette to replace a PG-1090 SRAM 11-26 cassette for a challenging hillymountain tour. PG-1070 costs 14 as much as the PG-1090 for a 70 gram2.5 ounce penalty. Used with compact crank, gear spacing excellent .... essentially a straight block from 12 through 17 where you spend most of the time while riding and a two tooth jump between the 17 and 19 then three tooth jump for the final three climbing cogs. Use the final 28 very infrequently, a 12-27 might be just as useful and gives closer jump from the 19 to the 21 and slightly lower climbing in the final three cogs. Don't really miss the 11 except on max speed downhills but nice to have the 16 to fill the straight block from 12 through 17. Rode the new cassette in Europe where many newer higher end bikes come from the manufacturer with compact cranks and 12-28 (or close) rear cogs. Excellent value, easy shifting, and just right gear spacing. Excellent product right out of the box. I use this cassette on a cx wheel with tubulars. The speed loader worked well when installing the cassette and the cassette has performed flawlessly in several training rides and two races. This cassette and wheel set is an upgrade from the stock clincher set up. I switched to the 11-28 for this years Levi's Gran Fondo, and shaved 7 minutes up the big King Ridge Climb. Last year I was running an 11-26, and was always looking for one more gear (maybe two.. ,-) This year I had the extra gears and just set a nice steady pace and had plenty of energy for the rest of the ride. Good quality from SRAM as usual, and very quiet on my Red drivetrain. Purchased this as an upgrade of my OEM cassette (on a SRAM component bike). Shifting was noticibly smoother and not as clunky. Highly recommend. Love it except for one large gap in the gearing that makes me angry when I have to hit it and significantly speed up my cadence on the downshift. If you're not using an 11, you're losing time. PERIOD. The gap is a necessary evil. Mated this SRAM PG-1070 10-Speed Cassette and SRAM PC-1071 10-Speed Chain with my 4 year old Shimano series 6600 drive train (SG-X 53B and 39-B, RD-6600, FD-6600, Ultergra shifters) with no issues what so ever Easy adjustment, clean shifting, more even and better steps between gear shifts. I replaced a Shimano SG-6600 1225 cassette with the SRAM 1128. This gave me notably faster flat speed and easier pedaling on the hills. I purchased this item (12-28) because it provides the gear ratio's I was looking for. It performs as expected but no bettrer or worse than other vendors I have used.